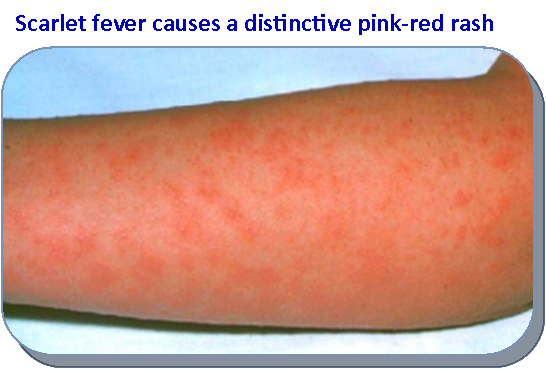 Scarlet fever is a bacterial illness that causes a distinctive pink-red rash. It is uncommon in the UK nowadays and is usually mild. The characteristic symptom of scarlet fever is a widespread, fine pink-red rash that feels like sandpaper to touch. It may start in one area, but soon spreads to many parts of the body, such as the ears, neck and chest. The rash may be itchy. Symptoms of scarlet fever usually develop two to five days after infection, although you will be contagious before showing signs of the illness. Scarlet fever is also known as scarlatina, although this often refers to a milder form of the disease. It usually follows a sore throat or a skin infection (impetigo) caused by particular strains of streptococcus bacteria. See your GP as soon as possible if you suspect you or your child has scarlet fever. Your GP can usually diagnose scarlet fever by looking at the characteristic rash and other symptoms, although a sample of saliva will need to be taken from the back of the throat (throat swab) and tested in a laboratory to confirm the diagnosis. There's no evidence that catching scarlet fever when pregnant will put your baby at risk. However, heavily pregnant women should tell healthcare staff if they have been in contact with someone who has scarlet fever. It can also be caught from carriers - people who have the bacteria in their throat or on their skin but do not show any symptoms. Anybody can catch scarlet fever, but it usually affects children aged two to eight years old. As it is so contagious, scarlet fever is likely to affect someone in close contact with a person with a sore throat or skin infection caused by streptococcus bacteria. It may also affect someone who lives in a crowded environment, such as day care. Between 2,000 and 4,000 cases of scarlet fever are diagnosed each year in England. You will only develop the symptoms of scarlet fever if you're susceptible to toxins produced by the streptococcus bacteria. Most children over 10 will have developed immunity to the toxins from streptococcal bacteria. It is possible to catch scarlet fever more than once, although this is rare. Scarlet fever used to be a very serious disease, but most cases today are mild. This is because scarlet fever can easily be treated with antibiotic tablets. These must be taken for 10 days, even though most people recover after four to five days. With proper treatment, further problems are very unlikely. However, there is a small risk of the infection spreading to other parts of the body, such as the ear, sinuses and lungs. Read more about treating scarlet fever and the complications of scarlet fever on the NHS Choices website.. If your child has scarlet fever, do not let them go to school and keep them away from other people until they have been on a course of antibiotics for at least 24 hours. All tissues and cloths that someone with scarlet fever has coughed or sneezed into should be washed or disposed of immediately. Wash your hands thoroughly with soap and water if you have touched any of these. Avoid sharing contaminated eating utensils, cups and glasses, clothes, baths, bed linen or towels.